Roast white sesame seeds on hot tawa till crisp taking care that they do not change colour. Roast peanuts, remove skin and then make a coarse powder. Lightly roast grated dry coconut. Mix sesame seeds, peanut powder, grated dry coconut and green cardamom powder. Melt jaggery in a thick-bottomed vessel (do not put water). Stir till it melts. Strain to remove impurities. Add half a tablespoon of ghee and mix. Cook, stirring on low heat, till a thick syrup is formed. To test if the syrup is ready, put a drop in a little cold water. If the syrup forms a semi hard ball, the syrup is ready. Add the sesame mixture and mix well. Remove from heat. 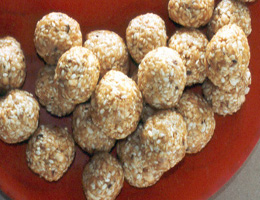 Grease your hands and make small marble-sized laddoos. Cool before storing.